SAN PEDRO — Gunned down in cold blood by a gang member 18 years ago, Takuma Ito and Go Matsuura could have been just another statistic, filed away with the crimes of violence that occur in Los Angeles on a daily basis. But their family and friends, and a filmmaker from their college, refused to let that happen. Their story is told in “Lives Interrupted,” a feature-length documentary that had its premiere on Oct. 24 at the Warner Grand Theatre in San Pedro with the father and brother of one of the victims in attendance. 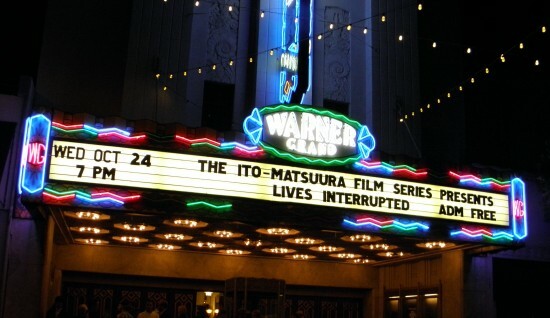 Ito and Matsuura were aspiring filmmakers who were attending Marymount College in Rancho Palos Verdes and planned to continue their studies at USC. Both had decided to study in the U.S. because of their love for American culture. But their careers came to a tragic end on the night of March 25, 1994. After having dinner with friends in Gardena, the two stopped at a Ralphs supermarket in San Pedro on their way back to the campus. In the parking lot, they were carjacked by Raymond Butler, who shot both students in the back of the head and drove off in their Honda Civic. Their parents rushed over from Japan, only to be told that the boys were brain dead and there was no hope of recovery. Butler was sentenced to death but remains in prison, where he has since been convicted of the murder of another inmate. In “Lives Interrupted,” filmmaker and Marymount College professor Bruce R. Schwartz recounts the tragedy and its aftermath. Stunned students, faculty and administrators visited a makeshift shrine at the scene of the crime. The murders made headlines in Japan, prompting apologies from President Bill Clinton and U.S. Ambassador Walter Mondale and a letter of condolence from Steven Spielberg. 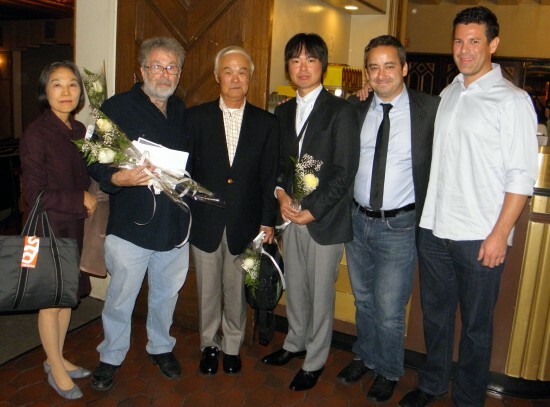 The parents started a petition drive urging stronger gun control laws in the U.S. At Marymount, a film series was named in honor of Ito and Matsuura. Schwartz interviewed former Marymount students who are still moved to tears when they recall the sudden and senseless loss of their friends, and traveled to Japan to meet Ito’s and Matsuura’s family and friends. He saw Ito’s bedroom, which has been maintained just as he left it. The investigators and prosecutors in the criminal case are also featured. Regarding the killer, attitudes range from compassion from Ito’s mother, who notes that Butler came from a broken home, to a friend’s frustration that the death penalty has not been carried out. 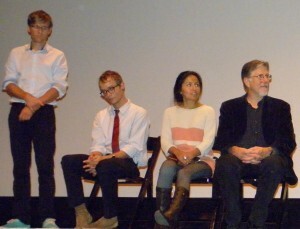 Schwartz recalled, “I didn’t quite know what I was getting myself into when I made this film, what a monumental task it would be … Literally hundreds of hours of work, 50 hours of footage reduced to an hour and 26, so we had … seven or eight interviews that are not in the film.” He was able to fit the various components into a narrative structure divided into 11 chapters. Accompanied by his second son, Hidehiko, Ito read a statement with Nobuko Yamazaki, the film’s line producer, providing English translation. “On Aug. 16, 1993, he left for America with mixed feelings of hope and anxiety. Often Takuma wrote to us, telling us his life as a student at Marymount College was even more enjoyable than he had expected. 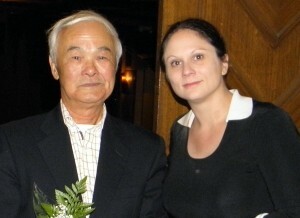 He had met Go Matsuura and made many American friends. He told us not to worry, that he was living a meaningful life. “Seven months later, the Japanese Ministry of Foreign Affairs called us to say that Takuma was gunned down by a gang member and that he was in critical condition. When we arrived in Los Angeles, we rushed to the hospital. We were shocked to see Takuma. Many times we called his name, but there was no answer. Takuma never opened his eyes again. We were devastated. He was killed by the guns in America, the country he loved so much. “I still feel that sense of devastation, and I feel Takuma himself was devastated. His life ended just as he was pursuing his long-held dream. I wanted to turn this devastation into something meaningful. That’s why we began our petition for gun control. In the film, Hidehiko Ito, who is now an attorney for crime victims, says he visits his brother’s grave every day and talks to him. Alexander Hufschmid studied film under Schwartz and served as the documentary’s cinematographer. “I’m at a complete loss for words … to communicate what this project meant to me … It was truly an unbelievable story. I loved how open and heartfelt and just committed to the truth Bruce was throughout the entire project, with every interview we did,” he said. Yamazaki noted that she was “totally ignorant” about the murders until she met Schwartz. 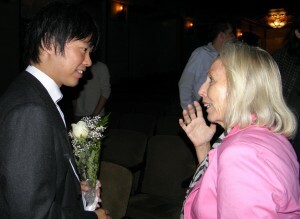 Although she apologized for her lack of technical skills, which she said was “a great inconvenience” to the filmmakers, Schwartz praised her for providing all of the translations and subtitles. Also on the stage were Rocky Davis, who composed the music, and Thomas Broesma, who did sketches recreating the incident. Broesma said visiting the Ralphs parking lot to prepare for the sketches was a strange experience, especially when he realized he had parked in the same spot as the victims. For more information on the film, visit www.takandgo.com. Great article and wonderful to reconnect with you at the Warner Grand in San Pedro, J.K. Yamamoto. I was sooo surprised that you recognized me. Hope to see you again some time and read more of your articles.